Well this was bound to happen. I mean, I love tiramisu and my husband loves Oreos...so like, who's really surprised here? Not us, that's for sure. It's what marriages are for, really- to make amazing dessert babies. And baby, this dessert IS amazing. It all started when I made this pumpkin tiramisu for Thanksgiving last year, actually. It was then, that I realized that one of my favorite desserts didn't have to be confined to the traditional lady finger/coffee boundaries! Not that there is ANYTHING wrong with those guys, because obviously there isn't. In fact, as I wrote out those ingredients, I immediately started craving a nice big slab of cool tiramisu. And coffee. MmMmMmmm coffee. The pumpkin tiramisu was such a hit at family gatherings, that my brain was inspired to continue pushing the tiramisu limits! Hence why this Oreo Tiramisu was born. Honestly I've been waiting for an excuse to make this baby. It's been rumbling in my mind for some time now. *smile* So, it feels good to actually sit down, get it out of my mind and onto paper, test it, and make it a real thing. It didn't take a genius to come up with this "tiramisu" idea, though. In fact, I'm sure somewhere someone has been doing this for years. Me? I haven't seen it anywhere (still haven't), so I opted to make my own. Things went down like this: My husband had a birthday, he wanted cake, he loves Oreo cookies, I love tiramisu, so I smooshed the two ideas into one and made him this "cake". Plus, I was already baking two pineapple upside down cakes for one of his family get togethers, so this "no bake" dessert really helped me out, time-wise! Sweet! I wanted to keep most of the traditional tiramisu flavors and components that we love, but also give it a nice little Oreo makeover at the same time. I kept my favorite part of tiramisu- the mascarpone filling (goodness gracious), added a nice sweetened whipped cream layer, and removed the coffee component. Then I generously drizzled the entire top with a homemade chocolate ganache (sauce). Just because. You really do need to let this sit overnight- so everything sort of marries together and becomes it's own thing. But then I recommend removing the tiramisu from the refrigerator at least 30 minutes before serving, to allow the cookie's cream filling to soften a tad. 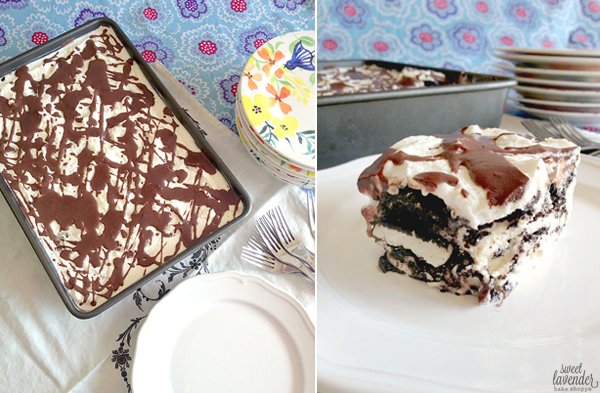 If you love tiramisu and love Oreos, then I promise this is for you. Plus it's easy as pie to make (might be something you could do with little ones!) and does NOT require an oven. Ahhh summer time heat relief. 1. 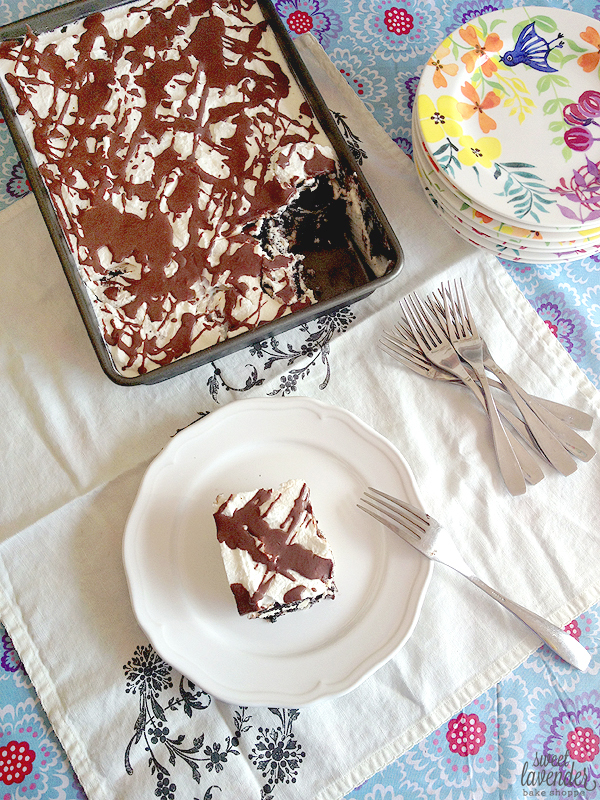 For this tiramisu, you will need a 9x13" baking dish. 2. In a shallow baking dish, mix together your whole milk and vanilla extract. Set aside. 3. In a mixer bowl with your whisk attachment, quickly beat the room temperature mascarpone with the 5 tablespoons of powdered sugar- about 10 seconds. Mix until just combined- mascarpone can break easily if over mixed. 4. With mixer on low, add your cold 1 1/2 cups heavy whipping cream. Turn speed back up to medium high and whisk until mixture is thickened and soft peaks form. About 1-2 minutes. Set aside in fridge. 5. In another stand mixer bowl (I only have one stand mixer bowl, so I transferred my mascarpone filling to another bowl before placing in the fridge, washed bowl, and dried thoroughly) add your 1 1/4 cups cold heavy whipping cream. 6. Beat on high with your whisk attachment until it starts to froth and thicken. Then, while mixer is still beating, slowly add your vanilla sugar and vanilla extract. 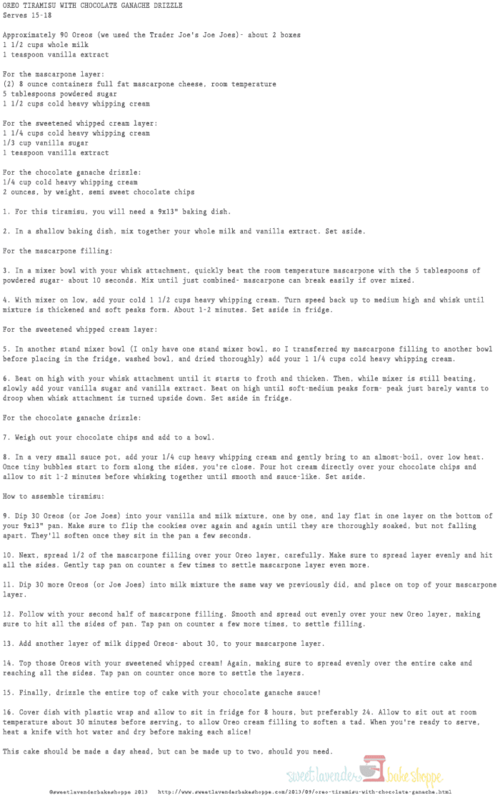 Beat on high until soft-medium peaks form- peak just barely wants to droop when whisk attachment is turned upside down. Set aside in fridge. 7. Weigh out your chocolate chips and add to a bowl. 8. In a very small sauce pot, add your 1/4 cup heavy whipping cream and gently bring to an almost-boil, over low heat. Once tiny bubbles start to form along the sides, you're close. Pour hot cream directly over your chocolate chips and allow to sit 1-2 minutes before whisking together until smooth and sauce-like. Set aside. 9. Dip 30 Oreos (or Joe Joes) into your vanilla and milk mixture, one by one, and lay flat in one layer on the bottom of your 9x13" pan. Make sure to flip the cookies over again and again until they are thoroughly soaked, but not falling apart. They'll soften once they sit in the pan a few seconds. 10. Next, spread 1/2 of the mascarpone filling over your Oreo layer, carefully. Make sure to spread layer evenly and hit all the sides. Gently tap pan on counter a few times to settle mascarpone layer even more. 11. Dip 30 more Oreos (or Joe Joes) into milk mixture the same way we previously did, and place on top of your mascarpone layer. 12. Follow with your second half of mascarpone filling. Smooth and spread out evenly over your new Oreo layer, making sure to hit all the sides of pan. Tap pan on counter a few more times, to settle filling. 13. Add another layer of milk dipped Oreos- about 30, to your mascarpone layer. 14. Top those Oreos with your sweetened whipped cream! Again, making sure to spread evenly over the entire cake and reaching all the sides. Tap pan on counter once more to settle the layers. 15. Finally, drizzle the entire top of cake with your chocolate ganache sauce! 16. Cover dish with plastic wrap and allow to sit in fridge for 8 hours, but preferably 24. Allow to sit out at room temperature about 30 minutes before serving, to allow Oreo cream filling to soften a tad. When you're ready to serve, heat a knife with hot water and dry before making each slice! This cake should be made a day ahead, but can be made up to two, should you need. Oh Oreo Tiramisu, how I love thee. Um, let me just take a minute to pick my jaw up from the ground! This looks so ridiculously good. 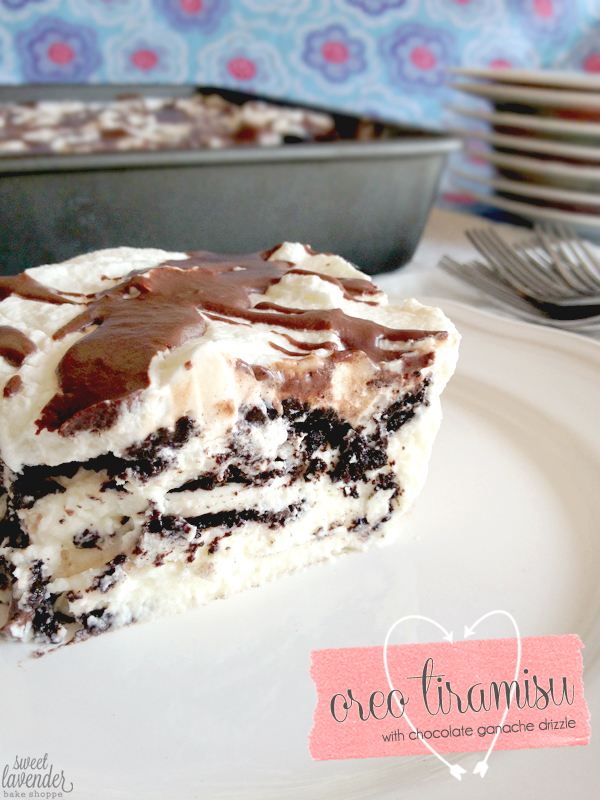 I am totally pinning this to make for a dessert night down the road. You have combined my two great loves into one awesome dessert. Can't wait to try it out! My pants are going to hate you for this, but I cannot resist it! Tiramisu is my FAVORITE! !